On the 25th of march 2014, Transport Minister Danny Kennedy announced his decision to proceed with the £35 million A31 Magherafelt bypass road scheme. Funding for the scheme was approved in July 2013 and Minister Kennedy announced the making of the necessary Vesting Order and commencement of procurement for the scheme. Minister Kennedy said: “The A31 provides the key transport route between Cookstown, Moneymore, Magherafelt and Belfast. The provision of a new bypass will generate a number of benefits for road users helping to reduce congestion, improve journey times and road safety in Magherafelt. 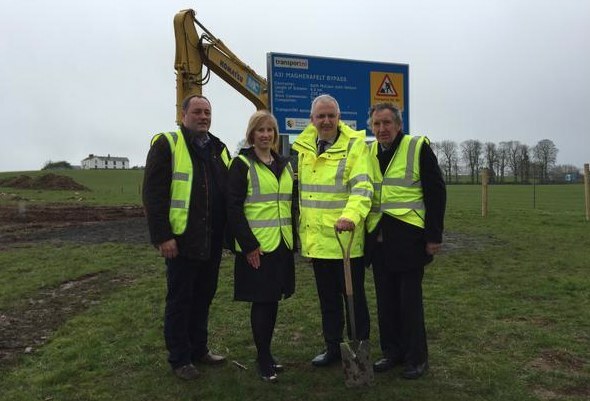 On the 27th of February 2015, Transport Minister Danny Kennedy MLA announced the appointment of consortium BAM/McCann as construction contractors for the A31 Magherafelt Bypass. Announcing the contract award, Minister Kennedy highlighted the importance of the scheme and said: “The A31 is a strategically important route which links the West Tyrone and Mid Ulster areas to the M2, Belfast and the north east. Magherafelt town suffers from significant traffic congestion, particularly during peak periods with parts of the existing road network within the town centre carrying around 25,000 vehicles per day. This very significant investment will help improve road safety, reduce congestion and improve journey times. The Construction of the scheme which has already started will provide approximately six kilometres of new carriageway between the A31 Moneymore Road at Coolshinney Road, south west of Magherafelt, and the A6 at Castledawson Roundabout, north east of Magherafelt. The scheme will incorporate a number of roundabouts, under bridges and dual acceleration lanes and is expected to be completed by October 2016.